Deep beneath the Dwarven mines lurk all manner of strange beasts, and woe to the foolhardy miner who wanders off alone. 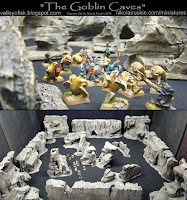 Here are a couple pics from the cave set I just finished, modular scatter terrain for underground battling. 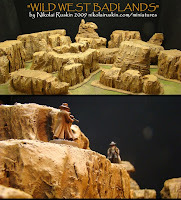 The Badlands scenery set for Wild West battles is complete. I developed a new technique for creating natural stone and rock formations using a sheet rock knife, bread knife, box cutter sculpting rasp and propane torch. Behold the results here: a table full of inhospitable scenery for your gunfighters and Gorkamorka / post apocalyptic mayhem. Coming next: Caves and Chasms.